« Delphi – back in 1996 – CARDS.DLL component wrapper in Delphi 1 and 2! I got a few comments about people implementing the TInterfacedDateModule from my post Delphi – Using FastMM4 part 2: TDataModule descendants exposing interfaces, or the introduction of a TInterfacedDataModule. After applying the ideas, and reloading the datamodules in Delphi, some of you got datamodules that looked like forms in the designer. I’ve not seen this behaviour in the IDE myself, but it must be a bug somewhere. I should have been clearer when writing about the solution for frames looking like forms in the designer from my post Delphi – Frames as visual Components – changing your inheritance: that solution also applies to datamodules. I hinted on that by writing This is caused by the fact that the IDE […] does not recognize as a designable class like TFrame or TDataModule, but only covered the TFrame case. If your datamodule suddenly looks like the image on the right, and/or you get complaints about properties like ClientHeight, ClientWidth, OldCreateOrder, PixelsPerInch or TextHeight, then need to change your dfm file. If you do so, then it will look like the picture on the right side again. This entry was posted on 2009/08/20 at 13:13	and is filed under Component Development, Database Development, Delphi, Development, Package Development, Software Development. You can follow any responses to this entry through the RSS 2.0 feed. You can leave a response, or trackback from your own site. 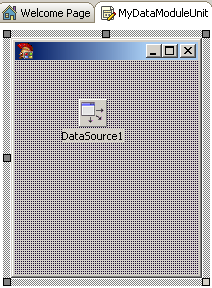 It seems to be a bug in the IDE. 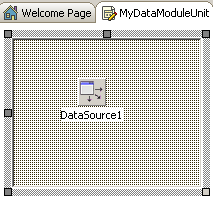 When I click the compiler-button or CTRL+F9 the inheritance between two DataModules is released. If you don’t change the size of the child only Height and Width is added to the sourcecode. But if you change the size ClientWidth and ClientHeight is added. If you change from object to inherited in Text-Mode manually you also need to switch to Designer-Mode to get and ignore all the Error-Messages. If you don’t switch back, you get these messages on Runtime. Thanks for the update. I’ll try and see if I can reproduce this.